My studio is really coming together. I spend less time looking for things and more time working. It’s great to have this available. Today I worked with gouache on a sanded pastel paper. I used chalk over the top of the painting. Thank you to Janet who brought us a bucket of these beautiful Barletts at the Farm Stand on Saturday. Such beautiful shapes and colors. Hope I have a little time tomorrow too. This bowlful of pears was so beautiful, I took a photo. Thank goodness I did as they are all turning ripe at the same time, so most are in the refrigerator now. My studio now has a shelf for still lifes with excellent lighting. What a difference it makes! 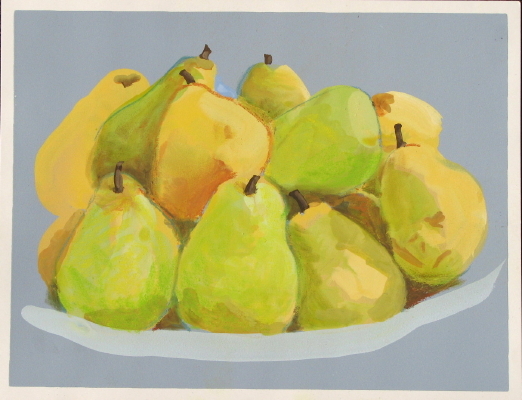 This entry was posted in Uncategorized and tagged Colourfix paper, gouache, Painting. Bookmark the permalink. Thanks Elizabeth. It’s actually done in gouache, which has a very “chalky” look. 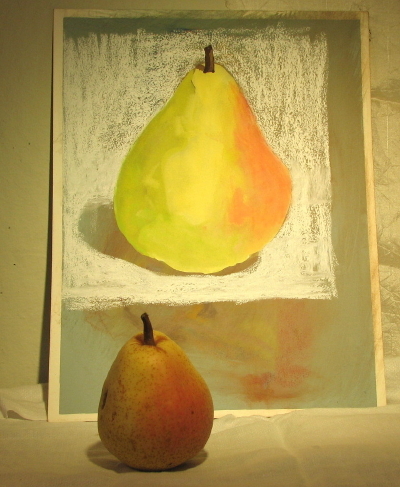 I did use chalk for the background and a few touches on the pear itself, but it’s mostly paint.